There are two types of film within the rarefied world of the Hollywood Blockbuster – those made by Steven Spielberg, and those which aren’t! War Horse, the WWI drama based on Michael Morpurgo’s bestselling children’s book of the same name, is big in only the way that the godfather of the modern epic can do. Starring newcomer Jeremy Irvine, British film stalwart Emily Watson and heart throb of the moment Benedict Cumberbatch, this is a war film with the novel twist of being told (or at least as near as you can get to it) from the horse’s point of view. The story follows the trials and adventures of Joey, a thoroughbred horse, sold to serve with the cavalry on the battlefields of France during WWI. Traded to the army by Devon farmer Ted Narracott (Peter Mullan) to raise money to settle his debts, Joey survives unimaginable hardships on the frontline, touching the lives of everyone he comes into contact with, before the ultimate reunion with his master, Ted’s son Albert (Irvine). First let me say that it’s not spoiling it to reveal that everything in this film ends up happily eve-rafter (at least where Joey and the Narracott family are concerned). There are probably few people around who, if not having read Morpurgo’s book or seen the subsequent hit stage interpretation, have not at least heard of it and know the basic plot. But seeing the story now unfold on the big screen, it is unlikely that you will remain unmoved irrespective of your familiarity with it. No newcomer to the drama of war Spielberg eschews the brutality of his previous forays into this arena, with Schindler’s List (1993) and Saving Private Ryan (1998), for the emotion of family ties and friendship, both human and animal. In fact the film’s lack of blood and visceral imagery adds to its heart rending poignancy which will likely have even the most hardened cinephile moved to tears. His casting of newcomer Jeremy Irvine in the lead role is a clever move on Spielberg’s part. Undeniably accomplished as Irvine’s portrayal is of the young man so devoted to his beloved Joey that he enlists in the army in the hope of being eventually reunited with him, his lack of ‘star power’ (which is likely to changed dramatically after the film’s release) means that the viewer’s attention is instead concentrated on the predicaments and challenges facing Joey. The characters who pass through Joey’s life – whether the idealistic cavalry officer Captain Nicholls (Tom Hiddleston), the young French girl Emilie (the mesmerising Celine Buckens) who rescues and becomes besotted with him, or the various German and English soldiers who call a brief truce in order to free Joey from the entanglement of no man’s land on the battlefield – are a mere supporting cast to the true star of the film. Even a characteristically gritty and earthy turn by Watson as Albert’s downtrodden but resilient mother Rose, cannot overshadow the presence of the fourteen horses (including the ‘main’ one called Finder, who portrayed Seabiscuit in the 2003 film) who played Joey at varies stages throughout the film. The film’s other star is undoubtedly the bucolic splendour of rural Devon and France, against which proceedings play out. Shot in a heightened palate of rustic tones, the backdrops of ‘shabby chic’ farmhouses in which most of the human cast appear to live, contrast with the harshness of the Devonshire farmland and seeping dankness of the French trenches. Spielberg reportedly calls War Horse his homage to the Hollywood films of the 1930’s and 1940’s, which is perfectly believable in the light of the film’s closing scenes which could have been lifted straight from the climax of Gone With The Wind (1939). His claim however that no digital trickery was involved with the sunsets and piercing blue sky which regularly punctuate the film may be harder to accept. There again, as we all know, nowhere does naturally dramatic weather better than rural England. 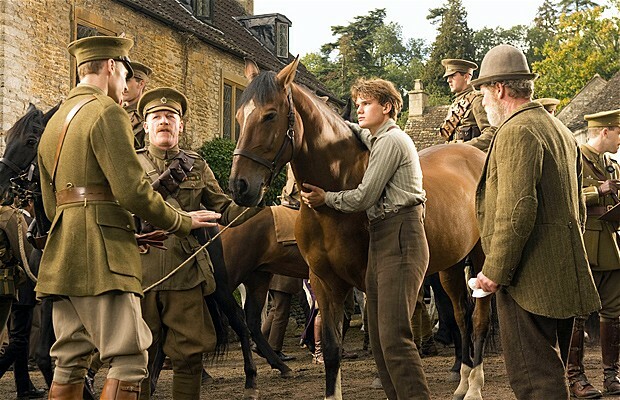 Everyone involved with War Horse, and not least Spielberg himself, are reported as saying that if the film does nothing else they hope that it will serve as a warning against the tragedy and futility of battle and as a lasting testament to the forgotten heroes of what was meant to be the war to end all wars, the innumerable horses like Joey. A feat it accomplishes majestically.